How Many Parking Spots Will Developers Build at Transit-Rich EDC Site? Since being cleared for redevelopment in 1967, several city blocks at the base of the Williamsburg Bridge on the Lower East Side — known as the Seward Park Urban Renewal Area, or SPURA — have lain fallow. For decades, the largest undeveloped, city-owned land below 96th Street was used only for surface parking lots. After years of planning work, this afternoon marked the deadline for developers to submit bids for the site to the New York City Economic Development Corporation. With today’s milestone, it’s worth remembering how EDC’s plan to transform the SPURA parking lots still encourages developers to build more parking than would otherwise be allowed. The SPURA project, sitting atop four subway lines, includes 1,000 new housing units, half of which would be designated as “permanently affordable,” new commercial uses, and an expansion of the Essex Street Market. Under the city’s parking maximums, which have limited the addition of parking in much of Manhattan since 1982, no more than 345 parking spaces would be allowed. Those “accessory” spaces are meant for use by building tenants. The project’s own environmental impact statement estimates that the project’s maximum demand for parking would be only 257 spaces. But EDC has received a special permit enabling up to 500 public parking spots at the SPURA development. And the agency told Streetsblog last year that it wants to replace every one of the approximately 400 parking spaces currently on site. As with its other development projects, EDC is apparently unwilling to let this site become a more urban place with less parking than exists today. Meanwhile, the Department of City Planning is approaching the finish line with its proposal to amend the rules governing off-street parking in Manhattan below East 96th Street and West 110th Street. The plan, which contains many positive changes, such as eliminating parking requirements for affordable housing and retroactively applying stricter parking regulations to pre-1982 development, also contains some potential pitfalls. For example, it may make it easier for developers to obtain special permits to build public parking garages that exceed parking maximums — the process that EDC has exploited to cram up to 500 parking spots into the SPURA project. The Manhattan Core parking policy change was approved by the City Council’s Land Use Committee last week, 16-0, with one abstention (Jessica Lappin). Next it goes before the full City Council, followed by a signature from Mayor Michael Bloomberg. There is a direct correlation between the perceived quality of place and the scarcity of parking. A parking problem will soon be something that we embrace. You do not have a good place unless you have a parking problem. Your neighborhood is not improving unless your parking scarcity is increasing. The primary focus of economic development and transportation planning should be to create destinations that people really want to be in, that will turn maximize the potential for efficient transportation systems and sustained economic development. EDC needs to learn that Placemaking should lead economic development and planning, in ways that transcend density, design and development-led thinking. It may be worth asking these people under what circumstances, if any, it would ever be appropriate to reduce the amount of parking built at any given site. Does Seth Pinsky have a parking placard? What they create is a demand for transportation. If he has a parking placard, then he probably considers “demand for transportation” and “demand for parking” to be synonymous. In fact, more than anything else, parking itself creates a demand for parking. Calling this location “sitting atop four subway lines” is kind of misleading. It’s only atop the Sixth Avenue line and the Nassau Street line, and the Nassau Street line does very little for a lot of New Yorkers. It still doesn’t mean there should be a ton of parking, but let’s not act like we’re talking about Times Square here. That doesn’t even make the Top 100 list of worst things that could be done. Number one would be continuing the anti-urban building patterns that Robert Moses and the city used in the surrounding blocks. Number two would be inadequately addressing urban structure that supports street life, particularly on Delancey, which Moses and the city also gutted. Eighty percent of Manhattanites don’t own cars (and the number is probably lower downtown), but for 50 years we focused on making life better for drivers. 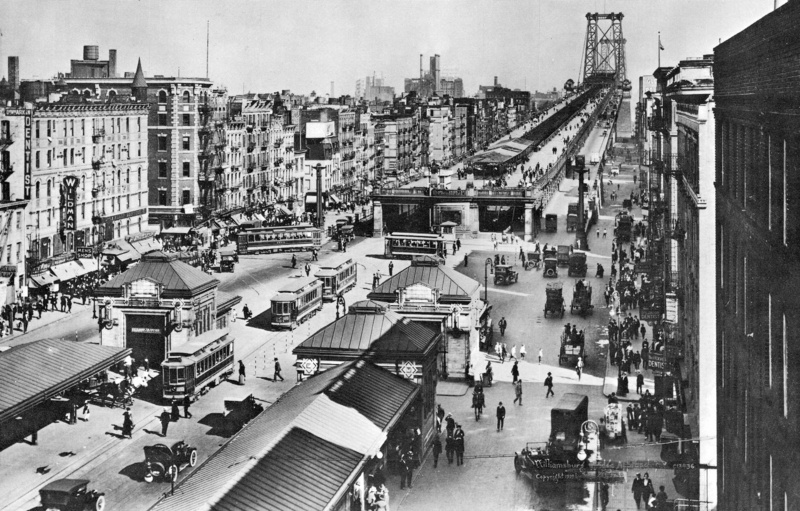 Delancey itself is a high-volume, suburban-style arterial to make it easier for others to drive in and out instead of taking trains, subways, buses, express buses and bikes. Ethan is right. Pinsky is wrong. We demolished the dense cluster of old tenements on the SPURA site, none of which had off-street parking, in 1967, because back then we thought that kind of housing was blighted beyond repair. The housing was kept in poor condition by slumlords and was occupied exclusively by poor people. Urban renewal was seen as a social betterment for them. But on the north side of Delancey, where we didn’t do any wholesale demolition, people are now paying top dollar to live in those same types of old buildings, none of which have off-street parking. If there’s such a parking need for people living on the LES, why do young professionals keep moving there? The vast majority of them aren’t car-owners. They want to live in a walkable neighborhood. Refusing to build loads of off-street parking wouldn’t make SPURA become a “more urban place.” The place that urban renewal destroyed didn’t originally have parking. If the project had no off-street parking it’d be in keeping with the historic nature of the neighborhood.